Laleh June is pleased to announce it will show Philippe Zumstein. The exhibition will open on October 23 and will feature new paintings and sculpture by the Swiss born artist. The opening reception will be on October 23. Philippe Zumstein (b. 1973) lives and works in Geneva. Zumstein has shown at institutions such as Musée des Beaux-Arts de la Chaux-de-Fonds, Musée des Beaux-Arts de Lausanne, CAN, Kunsthalle Palazzo. The use of saturated and violent colors, overflowing paint and the deformation of matter are some of the elegant possibilities offered by the work of Philippe Zumstein as a means for breaking away from the canvas as an object. His first paintings, the Fat paintings, contained so much liquid paint beneath their surface that they seemed ready to explode at any moment. His more recent works, the Crash paintings, bear the stigmata of an accident. These works share a formal efficiency and a plastic refinement. The artist questions the age we live in through our intimidating fascination for the design object which we sometimes hesitate to handle. He does so by adding a fault to his objects that reveal their fragility. The destiny of the object, condemned to beauty, is here united with the individual’s destiny. Below the object’s smooth and perfect appearance a chaotic truth lies buried; we cannot disregard it for long. Indeed, everything is destined to vanish but, prior to the final crash, we must create the illusion that this is not so. Customizing our cell phones and cars is not unlike exercising with the goal of maintaining our bodies in shape. The accident exposes real identity. Before crashing into a wall, the racing car of Ayrton Senna, was pure speed: it revealed itself as matter. This materiality in the works of Zumstein, is held at a distance through the use of reflecting surfaces and sophisticated and changing colors obtained by polyurethane paint. The deformation that the artist inflicts onto the matter used in his works, whether it is the paint of his Fat paintings or the reflective surfaces of his later works, faintly resonates with a certain concept of beauty. At the same time, it is the accident that deforms the reflecting surfaces and provides them with relief, thus capturing the space between their folds, determining and directing their shape. The surface is also the point of contact between the artist and the technique, since the artist creates or prints the accident directly onto the matter. The Fat paintings presaged an accident. In the Crash paintings, it is both the artist that deforms and gives relief to the matter while he increases the power of an element that is external to the work, namely light. The latter captures the space within the folds and gives personality to the shapes created. It erotizes the surface and playfully creates a dialogue with the spectator who perceives his own reflection. 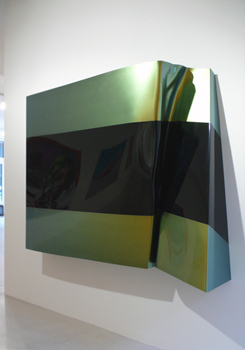 The formal independence gained by modernist painting, since the Black paintings of Frank Stella up to the wrinkled canvases of Steven Parrino, via the monochrome palette and the Neo-Geo movement, has not served to make its presence on a wall less uncertain since it provides more questions than answers. Indeed, since modernist painting no longer evokes an elsewhere (representation of the world, natural forces, etc. ), everything about it points to the here and now. To this material presence, Philippe Zumstein adds to his works a visual seductiveness, an unresolved formality and, sometimes, a seductive sense of vertigo. His works both reflect their environment and protect themselves from it, all the while bearing silent and questioning witness.